So apparently, the MET office have issued a severe weather warning for the next two days! The snow isn’t constant, but we’re havving occasional dense flurries (read: mini blizzards) of it. I don’t mind so much about being delayed by snow. Snow is pretty. It’s pretty much nationwide though. 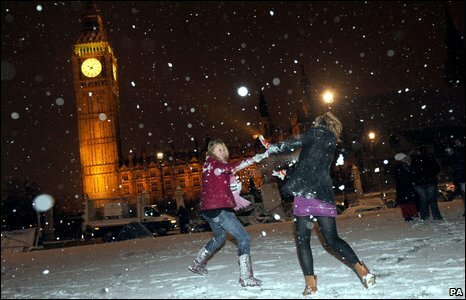 The funny thing is that most British people don’t really get snow. People in the streets largely fall into one of two categories — people wearing excessive amounts of warm winter clothing, and people wearing not nearly enough! In the latter case, you can tell by the facial expressions that they were probably wishing they’d worn a scarf. So the cause for all this cold (coldest December since 1996, apparently) is a blanket of high pressure air sitting above the UK. This has been spiralling in a clockwise direction and sucking cold arctic air down over us all. Our lovely warm gulf stream air has probably been deflected by this and, I guess, is probably giving Iceland some nice weather at the moment. Weather in this country can potentially be very cold. The all time record was just under -27C (in a remote part of Northern Scotland). It’s been mild the past few years, but… the scary thing is that if global warming manages to shut down the gulf stream, we’d better start getting used to weather like this. Being at the same lattitude as Siberia, this little island is likely to get rather cold without those warm ocean currents! Image taken from the BBC News website.